"I don't want to go there" said Siri while walking reluctantly with her cousin Dean towards the uninhabited house beyond the stream. "Oh come on Siri. It's just a house" Dean quipped as they trampled upon bushes "Don't tell me you are scared?" "Of-course I'm scared!" Siri retorted as they approached the house through the old dwindling bridge on the river "Why would you want to go there anyways? I shouldn't have come with you!" "Oh relax!" sighed Dean as they stood there for sometime looking at the house in ruins, rumored to be haunted. The eerie silence of the surrounding heavy air around them was broken when Dean suddenly cried "Did you hear that?" "Hear what?" said Siri alarmed as she looked from right to left to see what her cousin could be talking about. He looked genuinely startled and Siri was even further convinced it was a mistake going there. "I think there's someone inside" mumbled Dean while briskly making his way towards the house. "Let's go back" whispered Siri as she found herself unable to move out of fear. But Dean still entered the house shutting the door behind him with a thud as Siri looked on for about fifteen minutes, waiting for him to come out. Finally losing patience she entered the house and almost had a heart attack when she heard a bunch of people scream "Surprise! Happy B'day Siri!" 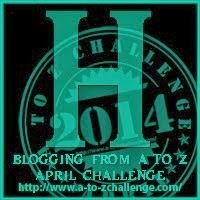 Linking this post for A to Z Challenge. As I promised in the theme reveal post, as part of the Challenge I'm going to write short stories with one or more emotions beginning with the alphabet of the day as the prompt or central idea for the post. Hope you enjoy the challenge! Linking this to UBC too.